Sometimes I have to catch a late night flight to Orlando or have to leave on a very early flight in the morning. While I love to stay at Disney World Resort hotels, it doesn’t make sense to pay the premium when I won’t be able to spend much time there! In these situations, I like to save some money and stay somewhere else on my first or last night. If you are basically just sleeping in the room and don’t mind switching hotels, I suggest crashing somewhere cheaper on your first or last nights. Here’s my advice for where to stay on your arrival or departure nights on your Disney World vacation. If you are coming in on a late flight or leaving very early in the morning, your best option might be to stay close to the airport. There are many hotels located a stone’s throw from Orlando International Airport (MCO) that offer free shuttles to/from the airport. You can collect your bags, take a five-minute shuttle ride and be in bed quickly after arriving. The next morning you can take the free shuttle back to the airport and grab the Magical Express or spend the $35-$40 on an Uber or Lyft ride to your Disney hotel. One airport hotel I can personally recommend is the DoubleTree by Hilton at the airport. We stayed there for one night last month before an early morning departure flight and it was perfect. They have a free shuttle to/from the airport that runs every 15 minutes (the hotel is about a mile from the airport). To set it up, just call the hotel ((407) 856-0100) when you are ready to be picked up at the airport and they will tell you where to find the shuttle. Just mention it at check-in if you’d like to take the shuttle back to the airport. We stayed here for free thanks to my stash of Hilton Honors points (click here to learn how we use Hilton Points to stay in hotels like this for cheap or free!) This place is a steal at only 20,000 points per night. Most Hiltons near Disney World require at least 40,000 points per night. Rooms here start at $125/night when you book through the Hilton site and there’s no resort fee. I have also stayed at the La Quinta By Wyndham Orlando Airport North when we arrived the night before we checked in for our stay at Disney’s Saratoga Springs Resort. I booked our stay at the La Quinta with a promo code through Hotwire and got this nice room for $62/night plus tax. We loved our room and the free breakfast at the La Quinta. Getting the shuttle to the hotel did take about 40 minutes due to traffic and many guests trying to take it at once, so be prepared for that. It would cost about $12 to take an Uber to the hotel so that might be a better option – especially if you got a great deal on the room like I did! If you are traveling with kiddos under 5 who would require a car seat in an Uber, your best bet would probably be to take the free shuttle to/from the airport and grab Magical Express. An Uber with a car seat is more expensive and it is difficult if not impossible to find one with more than one car seat. When you make your Magical Express reservation online, just enter a flight number that arrives roughly when you want to take the Magical Express bus. I use FlightsFrom.com to find a flight to or from Orlando that arrives or departs when I want. If you are taking Magical Express back to the airport then staying close by, enter a flight that is 3 hours later than when you want to be picked up. Disney just uses the flight info to assign you a Magical Express pick up time so it is fine to enter a flight that you aren’t actually on. We sometimes grab a room at a Disney Value resort for our arrival or departure night. 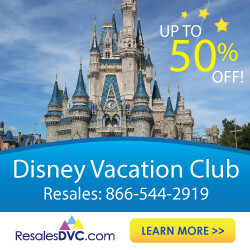 I’ve been able to get a room at a Value resort for as low as $49/night using these tricks for finding Disney World resorts on Hotwire. My personal favorite Value resort is Pop Century followed by All-Star Movies. You can read why in my post on the best and worst of Disney’s Value resorts. Art of Animation is great, but it is pricey for just a place to lay your head for a night or two. Rooms at All-Stars are currently in the midst of a major upgrade, so if you haven’t stayed there in a while check out the new look here. If you are staying at a Value resort for your arrival night, Disney will transfer your bags to another Disney hotel for you. You can head to the parks and your bags will arrive at your other hotel in the afternoon. Check out some helpful tips for split stays in this post. If you are arriving later in the day and taking the Magical Express, you might want to consider picking up your bags yourself instead of relying on “Mickey” to deliver them to your room. In my experience, it has lately been taking up to five hours for bags to be delivered. If your flight arrives at 6 pm you could be left without your bags until 11 pm, which is definitely after my bedtime! It might be worth it just to get your bags yourself so you won’t be left without your toothbrush or awakened in the middle of the night when your bags are delivered. And if you are taking Magical Express to the airport in the morning, keep in mind that your pickup time will be about 3 hours before your scheduled flight departure time. On several occasions I have stayed off-property close to Disney World on my arrival or departure nights to save money or because there wasn’t availability at Disney resorts. With Uber and Lyft now able to pick up at MCO (get tips on using them here), it is much more affordable to get to a hotel close to Walt Disney World. There are literally over 4,000 options for hotels in the Orlando area, so sifting through these to find a decent place can be overwhelming, to say the least! Here are places I can personally recommend based on my experience. We’ve stayed at the Hawthorn Suites Lake Buena Vista on a quick holiday trip to Walt Disney World. We only paid $75/night plus tax for a one-bedroom suite with two queen beds and thought the room was perfect for our needs (check out my full review of the hotel here). It is located less than a mile from the Disney Springs entrance to Walt Disney World. I highly suggest it as a budget-friendly option for your arrival or departure night! It doesn’t charge a resort fee or parking fee – a rare find for Orlando hotels – and you’ll get a basic free breakfast. Book directly with the hotel here for the best rates. We’ve stayed at the SpringHill Suites in Marriott Village and thought it was excellent for arrival night accommodations. The rooms were spacious and lovely. You can often get a room there for less than $100/night on the Marriott website. There is a $10/night parking fee (but no resort fees) and a free breakfast with Mickey waffles is included. 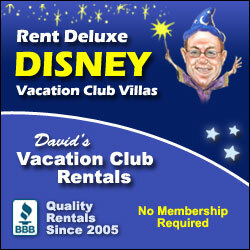 This location is easy to get to from both the airport and about 5 minutes from the entrance to Disney World. You probably have passed this resort on the Magical Express before! Caribe Royale is a large, all-suite resort located on World Center Drive about a mile from the south entrance to Walt Disney World. All of the rooms have a separate bedroom and sitting area and are well appointed. Caribe Royale has several on-site restaurants and bars plus a huge waterfall pool. Rooms start at about $120/night but you’ll also have to factor in a $25/night resort fee and $10/night self-parking fee. I suggest booking Caribe Royal on Orbitz since you can use a promo code to save 10-15% off the cost of the room. These codes don’t work on chain hotels but do work at Caribe Royal since it is independently owned. I hope this post gave you some ideas for arrival or departure night accommodations to help you save money on your next trip. 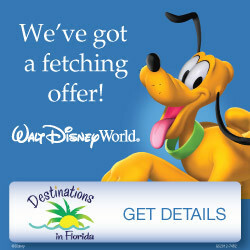 Any questions about where to stay around Disney World? Join the discussion in The Budget Mouse Facebook group! When you stay at an airport hotel and then take the magical express early the next morning, what do you do with your bags until check in time at your resort? Can you leave them with the front desk so that you can start enjoying the parks? Can they take your bags from the plane to the hotel and keep them there until you check in the next day? Good question, Emily! Yes, if you take a morning Magical Express you can leave your bags with bell services at your Disney resort and go on your way… they will hold the bags and often even deliver your bags to your room for you once it is ready. You would have to collect your bags and take them with you to the airport hotel and then to the Magical Express, however.